Android Marshmallow continues to see incremental growth in the install base according to the latest figures from Google. In the platform version dashboard report released today, Marshmallow’s install base grew from 15.2% last month to 18.7% this month. The growth was certainly expected given that a number of devices were updated to Marshmallow this past month from a wide range of manufactures. 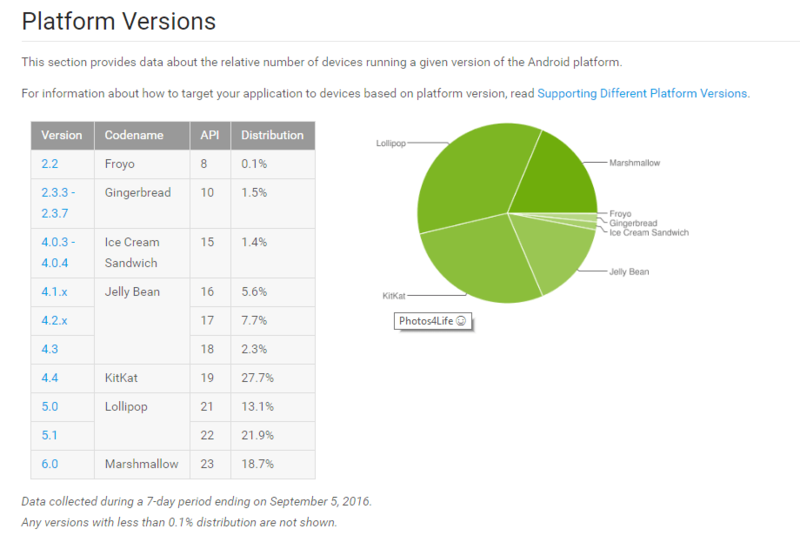 Still, Marshmallow remains well behind the leading release, Lollipop, which stands at 35% of the install base. As a reminder, these figures are derived by Google from devices that visited the Google Play Store for a 7 day period that ended on September 5, 2016. While it is by no means exhaustive, it does give a good indicator of the varieties of Android that are out there and still in use today. the drop in usage of KitKat and Lollipop are a good thing as it means more devices are being updated and older, less secure versions of the platform are going away. Still, remarkably, .1% of the Play Store traffic in this report came from Android 2.2, Froyo. As for ClintonFitch.com, as you would expect, the numbers are slightly different. For Android Marshmallow, during the same week, the site saw 64.98% of you visit on a device running it, down 5.02% from August. For Lollipop, 15.13% of you visited running that version, down just slightly from last month. KitKat was only 1.48% of traffic and yes, there is still one of you visiting the site running Froyo. Interestingly, some of you visited running Android Nougat, something that Google themselves did not see enough to report. That’s not overly shocking given the numbers they see in traffic on the Play Store versus what I see on the site. A full 10% of you came visiting with your Nougat devices while there were two visits from devices running 7.0.1 and five running 7.1, two builds not even public yet.